"Treating All High School Students Equally"
“To be clear, the Court is not saying that petitioners are not gifted, contrary to their claims. The Court is merely saying that the K to 12 Law was not infirm in treating all high school students equally. 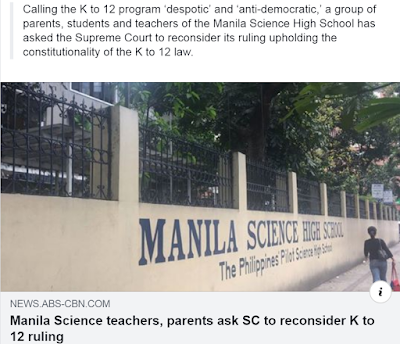 The Manila Science High School students are, after all, high school students just like all other students who are, and will be, subjected to the revised curriculum,” the Supreme Court of the Philippines stated in its ruling upholding the constitutionality of the country's K-12 curriculum. Equity, however, does not mean equality, and an effective education is one that responds to student's needs. The previous post on this blog, Focusing on What a Child Needs in Basic Education, talks about the problem of labeling children without actually addressing the needs of each child. This statement from the court is a very good example of how we terribly miss the central point of education. It does catch my attention whenever my alma mater, Manila Science High School, appears on the news. This time, the parents and teachers are appealing the court's decision. In the group's motion for reconsideration, their lawyer, Severo Brillantes argues that "not all Filipinos need a globally competitive education or one at par with international standards, meaning a 12-year basic education cycle." One of the main reasons often cited by the government is this assumed "international standard" for basic education. There is no such fish as a "red herring". And there is no such thing as an international standard for basic education. Cambridge International says, "There is no definitive set of international standards in education, either in terms of curriculum standards or in terms of assessment standards. However, the existence of, and rapidly growing interest in, international surveys such as PISA, TIMSS and PIRLS has created and emphasised a notion of international standards: those responsible for their country’s education system frequently look on their ranking in international comparisons as a measure of how well their systems are performing." Ironically, after landing near the bottom, the Philippines has not even participated in these international surveys recently. What the local needs are matter. What an individual student requires is important. This is the reason why there is no international standard. K-12 promises a student-centered curriculum yet it does exactly the opposite. This is where the problem lies. The curriculum is being decided by branches of a government that are completely not in a position to gauge where students currently are. The students of Manila Science High School may have unique needs and abilities, like other students in the Philippines. That is why differentiated instruction is important and a "one size fits all" approach is not good. Ironically, the K-12 curriculum, with its pretense of being fair and uniform, actually introduces tracking in high school. Truthfully, with the new curriculum, not all students are really subjected to the same curriculum. It is a lie.